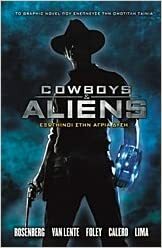 I picked up Cowboys & Aliens from the library since I had enjoyed the movie. I took a quick look and noticed that it was not the same story as the one told in the movie. So, I had to take it home to read. The comic explains some of the back story like where the lead character got his alien tech from. It has a better story I think and it a little funnier in regards to what his main alien weapon/tech is. The comic was also not very graphically violent so I let my 8 year old read it as well. Yes, I am that Dad that reads the comics first and then let's his kids read them if they are ok (by my standards). This one got a thumbs up and he quickly devoured it. On the subject of comics and kids, a comic I don't let him read is the Sonic the Hedgehog series. I find the stories in those a thin veil for some pretty series topics for kids. I found Cowboys & Aliens to be a fun romp of stupid conquering aliens who underestimate the human spirit. From what should be ridiculous odds in the favour of the aliens we see human ingenuity outsmarting the invaders for a last minute win. If you saw the movie and enjoyed it then this is not a retelling of the movie. It is an original story with some of the elements lifted for the movie but not a cut and paste meaning this comic is well worth your time if you want some more Cowboys & Aliens action.